At Bicycle Guider, we don’t believe in the terms ‘Men’s Bicycles’ and ‘Women’s Bicycles.’ We believe that there are unisex bicycles which can fit both genders equally well, depending on individual physical characteristics. There are also bicycles which are designed to suit a woman’s body better, but the only difference from unisex bicycles is a different saddle and a shorter stem. 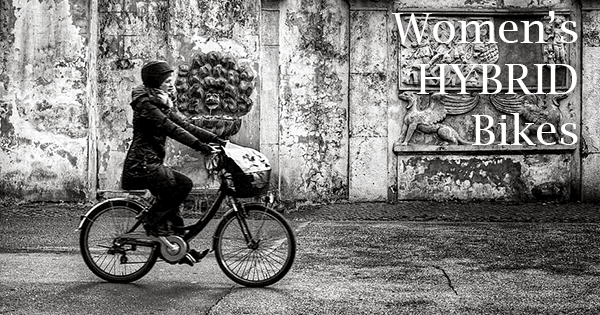 However, since there is an increasing number of women’s bicycles flooding the market, and these are usually reliable bikes that will serve you well for years to come, we’ve decided to create a review of the best women’s bikes. Hybrid bikes are versatile bicycles that can be used for commuting, training, or just casual riding. Hybrid bikes are fast, but have a comfortable geometry and are very stable and easy to control. 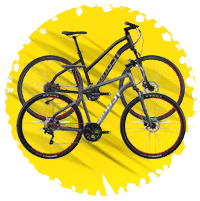 They combine the best from two worlds – road bikes and mountain bikes. These bicycles in most cases have 700c wheels, aluminum frames, some expensive models are full-carbon or have a carbon fork, and they can have front suspension or be completely rigid. There are lots of reliable female models for sale, so below we’ll show you the best hybrid bikes for women in our opinion. Tommaso Sorrento is a bicycle with comfort and value written all over it. 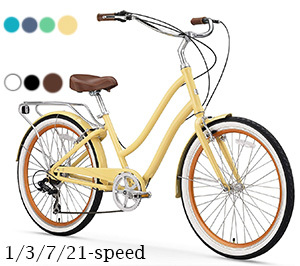 The fact that it is such a good deal easily puts it among the best hybrid bikes for women. It has a lightweight aluminum frame and a comfortable and durable steel fork, which makes it weigh around 25lbs. It comes with full Shimano components and plenty of gears to choose from. Tommaso Sorrento is available in only one color, but it’s a beautiful one nonetheless. 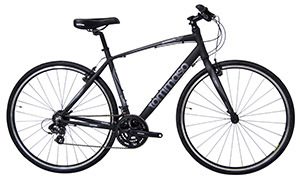 The elegant charcoal black sets it apart from other women’s hybrid bikes. Tommaso Sorrento is equipped with 700c wheels and tires that are 32mm wide, which is the perfect width for a compromise between speed, comfort, and stability. Moreover, the bike is available in five sizes, so you won’t have a problem finding the right fit. All of the most important components on the bike are Shimano, so you know that you are getting high quality at the right places. The derailleurs and shifters, as well as the whole drivetrain, are Shimano Tourney. This is a low-end solution, but at this price, it’s a great choice. One of the reasons the bike is so light is that it comes with V-brakes, instead of disc brakes. For casual riders and commuters, V-brakes are going to do the work just fine. Therefore, Tommaso Sorrento is a great commuter and one of the best women’s hybrid bikes for beginners and those who want to train more. Ghost Square Urban 1 is one of the unique women’s hybrid bicycles for sale on this list. 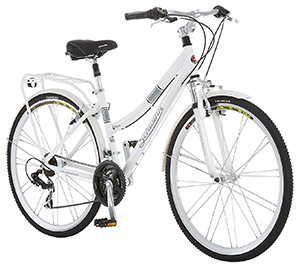 It is perfect for city commuters because it comes with integrated fenders and rack mounts. Therefore, it’s ready to be ridden even when the rain is pouring outside, and you can easily fit it with panniers to carry groceries or personal things. It comes in one color, a very sleek and smooth shade of gray, with light blue details which provide the perfect contrast. The Ghost Square Urban 1 is a rigid bike, which means that it does not have any suspension. It’s fully built from aluminum, so it’s lightweight, even with integrated fenders and racks. Moreover, this bike comes with a step-thru frame, which is a big plus on women’s hybrid bicycles because it’s easy to start riding. For around $800, you’ll get a Shimano Deore rear derailleur and a Shimano Acera front derailleur, with 27 speeds in total. This is a really large range of gears, which is perfect if you live in a hilly area. Another thing that puts Ghost Square Urban 1 among the best hybrid bikes for women are the hydraulic brakes. They provide the best stopping power and are the easiest to maintain and adjust of all brake types. 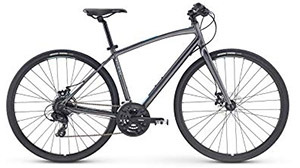 Buy If: you need a bike that you can ride in all conditions and finish errands around the city, while not worrying too much about maintenance, you’ll be happy with Ghost Square Urban 1. First of all, Diamondback Haanjenn 3 is one of the most beautiful women’s hybrid bikes that we’ve seen so far. The subtle shade of green is a real head turner wherever you go. However, component-wise, it is a great women’s hybrid bike as well. It’s perfect for rougher terrain due to wider tires with a knobby profile, which will ride on gravel with no problems. The Haanjenn 3 is a mid-range bike, so it’s perfect for those who want to upgrade their entry-level machines. 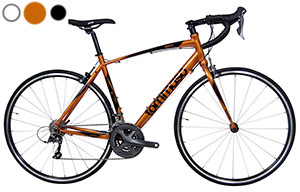 What sets this model apart from other ladies’ bikes for sale are Shimano road bike derailleurs. In this case, that is Shimano Sora groupset, which is usually put on mid-range bikes that are built to go fast and go for long. The drop handlebars offer several different hand positions, so your palms and shoulders will not get tired after long training. One thing that could be better on this model are the brakes since it comes with Tektro mechanical brakes, but we’d love to see it upgraded to hydraulic brakes. However, with proper adjustment, mechanical discs work like a charm as well. Other than that, the bike is light because of the aluminum frame and fork, and it has a women’s saddle, so it will feel great to ride. 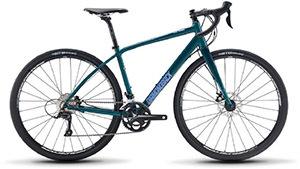 Buy if: you’re on the lookout for best women’s bikes to upgrade from your low-end hybrid and ride on gravel and rougher terrain, don’t look past Diamondback Haanjenn 3! The name of this Raleigh’s model completely befits it. It looks as if it came from the Wonderland, and with a price of only $500, it’s hard to believe that it didn’t. The rounded top tube design and the metallic gray color make it stand out wherever you go with it. If you order the bike directly from Raleigh, it will come already 95% assembled, so you’ll be able to ride it almost instantly. 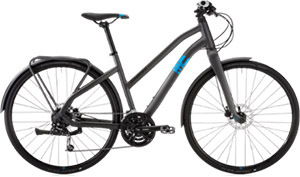 Raleigh Alysa 2 is the ideal combination of a lightweight road bike and a comfortable mountain bike. That is what makes it perfect for city commutes since you’ll be dealing with both fast flat sections, hilly sections, and rough roads. Shimano Tourney derailleurs and Shimano Altus Rapid Fire shifters will make your chain slide over 24 speeds quickly and reliably to get you up and down any hill. Of course, you’ll want to be able to stop quickly as well, where the Tektro mechanical brakes will jump in to help. They’re efficient and powerful, so you can ride as fast as you like. 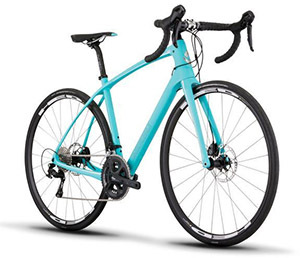 Raleigh Alysa 2 is one of the best hybrid bikes for women who ride in cities because of quality Kendra 700x35c tires, which are puncture-resilient and fast. It also comes with fender and rack mounts, so you’ll avoid getting wet from rain or from wearing a backpack. 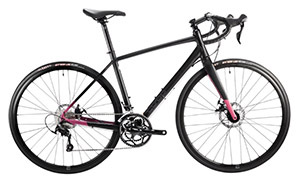 Buy If: f you want to get fast to work or explore the city, the Raleigh Alysa 2 is the perfect cheap women’s bike for you. Women’s road bikes are light and fast; they have narrow tires, lightweight frames, and road bike components. The best women’s road bikes will have carbon frames, deep section wheels, and high-end components, so take a look at our choice of best three below. Tommaso Imola is one of the most popular models by this Italian manufacturer. Upon closer inspection, it’s quite easy to see why. It’s good-looking, it’s affordable, and it offers quality components. We made an exception to this model, since it is a unisex road bike and not a women’s road bike. However, with the right saddle, it will fit anyone just perfectly, and it is too good of a deal to skip. When it comes to the choice of colors, Tommaso Imola is among the best women’s bikes. You get to choose from three attractive colors – black, white, and orange. Personally, orange looks the best to us, but it’s a tough choice. However, Tommaso Imola is not all looks and no brains. For brains, it has Shimano components, which are always a sign of quality. Specifically, it comes with a Shimano Claris drivetrain, Claris derailleurs, as well as Claris brakes. There are 24 speeds in total, so you’ll be zooming at high speeds both downhill and uphill with ease. Tommaso Imola uses V-brakes, which, along with the aluminum frame and fork, greatly reduces the weight. Tommaso has decided to fit it with 25mm tires, which are perfect for road riders who do not want to sacrifice either speed or comfort. Finally, the saddle is a WTB Volt, which might fit good both for men and women. BUY if you want to buy Italian design and Shimano craftsmanship for around $500, the Tommaso Imola will make you happier than ever! The Co-Op Cycles ARD 1.2W is the best women’s road bike for those women who decided to take cycling more seriously. It provides high-performance both on paved roads and gravel so you can have a variety of effective workouts. The combination of a lightweight aluminum frame and a sturdy carbon fork keep the weight way down and increase speed especially up the hill. However, that’s not all ARD 1.2W has, let’s see its high points. If you’re riding a road bike to get fitter and move your physical boundaries, the Co-Op Cycles ARD 1.2W has what it takes to help you. It comes with Shimano 105 components, which have the best ratio between price and quality and are Shimano’s workhorse groupset – they’ll last forever. The ARD 1.2W has a road-specific 2×11 drivetrain, so it provides you 22 fast speeds that will leave everyone behind on paved roads. However, the 11-32 cassette and wider 28mm tires mean that you can ride on gravel as well. You’ll be fast when cornering as well with the help of TPR Spyre-C mechanical disc brakes. These brakes have dual pistons, which means that they will be much quieter when braking and save your rotors from bending. The bike looks good as well (black with pink details) and has women-specific geometry, so I don’t know what you’re waiting for. Purchase the Co-Op Cycles ARD 1.2W if you want a powerful and fast training bicycle capable of a lot of things! Diamondback Arden 5 is the most expensive bike on this list, but it is also the most sophisticated one. This model costs around $2,000, and it is well worth that price. The full-carbon frame, painted in irresistible light blue color is simply too good to pass. Diamondback says they hand-built the Arden 5 to be the smoothest women’s road bicycle for sale that you’ll find. The components fitted on the bike support this claim, which you will see in just a moment. This fantastic bicycle has lots of great aspects to talk about, the most important one being the Shimano 105 components. You can see them on all the crucial parts of the bike, so you know your money is well-used. In total, you get 22 speeds on a 2×11 full-Shimano drivetrain, which will last for thousands of miles with proper maintenance. Of course, the derailleurs are Shimano 105 as well, as are the brakes. When you pay $2,000 for a bike, as it’s expected, you get top-notch hydraulic disc brakes. The rotors are 160mm both on the front and on the back, which is pretty standard on road bikes. Finally, the HED Flanders C2+ rims and Continental Grand Sport Race 700x28c tires are the most you can ask for if you want durability and speed. Are you a rider who likes training hard and riding fast? Then Diamondback Arden 5 Carbon is the best women’s road bike for you! Ladies’ mountain bikes come in different shapes and sizes. When talking about wheels, they are available in 26”, 27.5”, and 29” sizes. However, the best women’s mountain bikes, in our opinion, are those with 27.5” wheels. They ensure a stable and comfortable ride and ensure a good standover clearance. Apart from that, you can choose between hardtail women’s bicycles and full-suspension models. Hardtail bikes have just the front suspension, whereas full-suspension bikes have rear suspension as well. You should also be mindful of brakes and gears when looking at women’s mountain bikes. Mechanical disc brakes use a cable system much like V brakes. Hydraulic brakes use oil to transfer force from the lever to the calipers. Both can be good, buy hydraulic brakes usually have a much better stopping power. When it comes to gears, this is something you do not have to worry about. 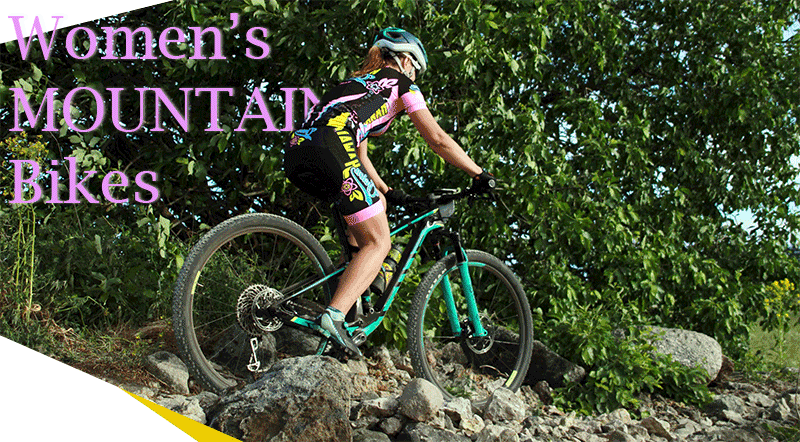 All women’s mountain bikes today have enough gears. Women can ride men’s mountain bikes as well, you only need to change the saddle and perhaps put a shorter stem, and you’re ready to go! Diamondback Lux 2 is an affordable hardtail women’s mountain bike that can conquer any terrain in the right hands. 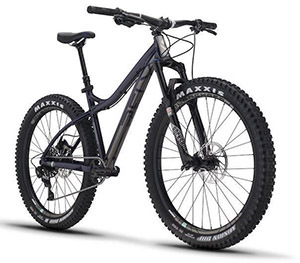 Lux 2 is a part of Diamondback’s wider series of exceptional ladies’ mountain bikes, which also include Diamondback Lux, Lux 1, Lux 3, Lux Sport, and Lux Comp. Some of these models are more expensive, and others are cheaper than Lux 2, so if you think this one doesn’t match your needs, check out the other ones. However, Diamondback Lux 2 is nimble, fast, light, and female-friendly, making it your choice definitely won’t be a mistake. Here’s exactly why! This 27.5 hardtail women’s mountain bike comes with a lightweight aluminum frame with a super-low top tube, which increases standover height, so it’s great even for shorter ladies. When you’re not standing over it but riding it, you can use Shimano Acera derailleurs to shift through 18 speeds on a 2×9 Shimano drivetrain. This is plenty of speeds to tackle your local hills so that you can have a good workout anywhere. Diamondback Lux 2 elegantly rolls on Kenda’s 2.35” tires, which is as wide as it gets. You’ll feel incredible stability even if you drive over rocks and dangerously bumpy terrain. You also get Shimano’s hydraulic brakes to control your speed finely, so it’s clear how good of a deal this bike is. 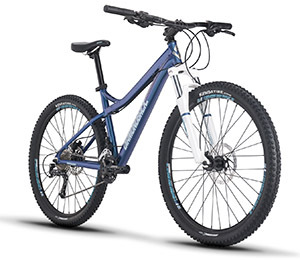 BUY Diamondback Lux 2 if you want one of the best women’s mountain bikes at this price range, which you can train on in all conditions and improve your skills. The Co-Op Cycles DRT 1.1W is a true gem when it comes to getting the most bang for your buck. It has several aspects that are rare to find on a women’s bike under $500. That makes it a fantastic women’s trail bike which does not give in to obstacles, however tough they appear. This 27.5” mountain bike, painted in an attractive Aquarius shade of blue, is built from aluminum and weighs around 30lbs. It’s specifically tailored to fit a woman’s body, which can be seen in the seat, stem, and the slanted top tube. The Co-Op Cycles DRT 1.1W bounces gently over any bumps by using a decent SR Suntour XCT fork with 100mm of travel. 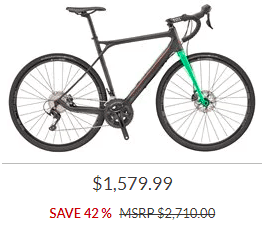 This is a great deal since most bikes in this price range come with 80mm of travel. You’ll get a great deal if you buy this model when it comes to components as well. DRT 1.1W comes with a combination of Shimano Altus and Shimano Acera parts and has 24 gears you can use. Most other ladies’ bike under $500 come with Shimano Tourney components. The Tektro Hydraulic Disc Brakes are the real cherry on the cake! They provide incomparably more stopping power than V-brakes and are much easier to use and adjust than mechanical disc brakes. 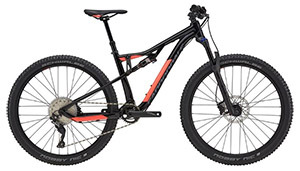 BUY IF you want one of the best women’s mountain bikes in this price range to ride in the forest or train more seriously on, the Co-Op Cycles DRT 1.1W has all that you need! With Cannondale Habit AL 2, we’ve finally arrived at the big players. 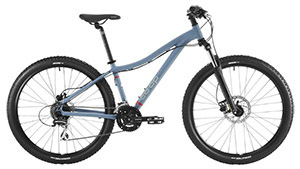 AL 2 is the best choice of a women’s FS (full suspension) bike that you can find right now. If you need a serious tool for your training and cross-country rides, this lightweight aluminum monster is exactly that. We understand performance is what matters most on unforgiving trails, but looks matter as well, and the Cannondale Habit AL 2 has them! It’s painted black with pink coral shades for contrast, so it’s hard to resist! The AL 2 has all the best you can ask for when it comes to Shimano parts. The front derailleur is a Shimano SLX, and the rear is Shimano XT. 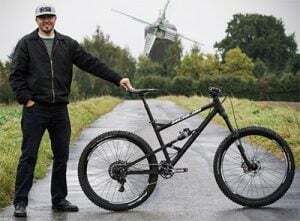 This bike also has a 1×11 drivetrain, which is the most popular today for real trail bikes. The suspension is taken part by RockShox Judy Gold fork with 120mm travel, and on the rear is a RockShox Monarch RT, also with 120mm travel. This will give you amazing comfort and stability on trails so that you can push your boundaries on every ride. A great high-end trail bike would not be called that without hydraulic brakes. The brakes are FSA MegaExo, while the levers are Shimano Deore. Finally, you’ll be rolling on WTB STP i23 TCS rims and Schwalbe Nobby Nic 27.5×2.35” tires which will just power through any terrain. The Cannondale Habit AL 2 27.5 is the perfect bike for anyone who wants to train hard, set new records, and have incredible amounts of fun! It has long been established that the best women’s bikes are those with 27.5” wheels, and the Diamondback Rely 2 is the best one of them! It is attractively priced, it looks good, it’s versatile, and it gives you a lot for your money. Rely 2 is a great hardtail bicycle, so it can take the most challenging tasks that you give it and complete them without giving them a second thought. The 27.5” wheels with 2.8” tires offer the most stability you can get and the most grip, so you don’t need to be intimidated of deep mud anymore. The Diamondback Rely 2 is priced at around $1,400, which makes it a mid-range bicycle. It’s intended for enthusiasts who have fallen in love with cycling and want to take it to the next level. This will be possible with excellent SRAM components scattered throughout the bike. The most notable examples are SRAM NX X-Horizon 11-speed rear derailleur and shifter which are famous for their durability. The suspension is taken care of with a 120mm-travel RockShox fork, with a lockout and external rebound adjust features. You’ll stop before you realize it when you press the levers of SRAM’s Level T hydraulic brakes with 180mm rotors, for lots of precision and power. The rims are tubeless compatible, and the tires are Maxxis Minion DHF. Therefore, if you want an excellent bike for serious training and high-level rides, but don’t want to pay too much, buy the Diamondback Rely 2! The Cannondale Tango 2 is one of Cannondale’s best attempts at a women’s bicycle. The whole Tango series is designed with ladies in mind, but this one caught our attention the most. It has narrower handlebar, shorter stem, shorter top tube, 27.5” wheels, and a women-specific saddle. All the boxes that you need for a comfy ride are checked. Even though Cannondale Tango 2 is a hardtail women’s mountain bike, it has SAVE micro-suspension tech added to the rear of its aluminum frame, which improves handling and the subjective feel. Tango 2 has a lightweight aluminum frame, with lots of standover clearance, as well as in the SR Suntour XCT fork with 80mm travel, which feels surprisingly nimble and responsive. This is most evident in tight turns and over big holes. Moving back, we can see Shimano derailleurs and a 2x drivetrain, which is characteristic of more serious trail bicycles. With Shimano parts, you simply know you won’t need to spend a lot of time and money on maintenance. Just put some bike lube on the chain, and you’re ready to rumble. Apart from that, the hydraulic disc brakes are not often seen on bikes in this price range. If they are, they are most often Tektro and not Shimano. Therefore, you get a lot in this area as well. So, buy Tango 2 if you want a do-all ladies’ mountain bike that doesn’t cost a lot and offers a perfect ride. Cruiser bikes are quickly gaining in popularity, as they are perfect for city-dwellers and those who need bikes to commute and complete errands. Cruiser bikes usually focus on comfort because they keep the rider in an upright position and give a better view of the traffic. 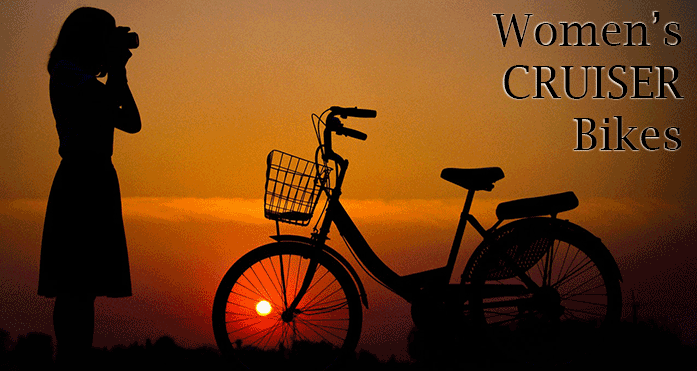 There are many women’s cruiser bikes with a basket, which makes it much easier to carry groceries or even your pets. If your bike does not have one, you can easily buy one on Amazon with a cover that keeps small pets secure, which is becoming increasingly popular. It’s easy to install; you just need to tighten a couple of screws. If you want to go for the tried and tested solution, this basket is the most popular on Amazon. It has a simple design, but it gets the job done perfectly. Cruiser bikes are probably the first thing that comes to the mind of an ordinary person when you mention the word ‘bicycle.’ Sixthreezero has a recognizable cruiser step-thru frame, 26” wheels, foot-forward pedaling design, and retro handlebars. The Sixthreezero is available with different gearing – you can buy a 1-speed, 3-speed, 7-speed, and a 21-speed. It has a stylish curvy frame, and it’s available in different colors, such as beige, green, dark blue, and light blue. Plus, you can also choose the color of the saddle and the handlebar grips! Sixthreezero will keep your body upright, which is perfect for leisurely city rides, where you need to visit a friend or do some grocery shopping. It comes with fenders the same color as the frame, and a rear rack to put your bags on. The rims are matching in color as well, which adds to its elegant appearance. You’ll be riding on 1.95” whitewall tires, which will cushion any imperfections on the road. The 1-speed model is perfect for flat city rides, but if you decide to buy one of the models with more gears, you’ll get quality Shimano components. The saddle has a double-spring mechanism on it, so you probably won’t realize that you’ve left your armchair when you’re riding it. The geometry is versatile, so it will fit riders between 5ft and 6ft 4in. BUY IF you want a stylish and versatile bike to complete your errands and do grocery shopping or have fun with friends in the park, buy Sixthreezero now! Huffy Fairmont is possibly the most elegant cruiser bike out there. It’s available in three colors – gloss white, gloss blue, and matte gray. We love the matte gray, but if you like shiny stuff, you’ll fall in love with the other two as well. Huffy Fairmont is built around Huffy’s Perfect Fit frame, which would fit people of most sizes. However, one review of a rider 5ft4in tall said that it fit her perfectly, so you gauge the size from there. The Huffy Fairmont is incredibly easy to ride and maintain. This is a single-speed model, so you do not need to worry about shifting – it’s perfect for flat terrains. Moreover, it has no brake levers, which means that you stop with the rear coaster brake. This makes maintenance even easier and less expensive. However, some riders do not like this solution, so this might be a downside for some. The seat has dual springs, and the geometry allows you to lean back, which will make your ride so much more comfortable. Generally, this bicycle has very good reviews on Amazon, which reassures us that it is a quality model. The bad reviews are from people whose bikes got damaged during transport or those who didn’t like the brakes, but this is subjective. 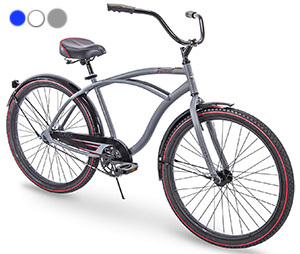 We say that, BUY IF you want a comfy and versatile 26” cruiser bike that also looks good, you should not think more than once about buying the Huffy Fairmont. As its name suggests, the Schwinn Discover will let you discover your city while having a comfortable and fast ride. This cruiser is unique because of its 700c wheels which are not often seen on cruiser bikes. They ride faster and make the bike higher, so you have a better overview of the traffic. Moreover, the Schwinn Discover has a Schwinn suspension fork which will make the bike feel like you’re riding on a cloud. The bike is even painted in white, the color of clouds, so it all checks out! It’s important to mention that more than 400 people have reviewed this bike on Amazon and it got a pretty high 4/5-star rating overall. This is probably because you get a lot of quality and extra features for just around $270. The 21-speed drivetrain with Shimano derailleurs and SRAM shifters means that you can ride this bike even if you live in a hilly area – there aren’t any excuses anymore. On the back, you also get a rear rack, where you can put all your things. No need to carry them on your back anymore and get sweaty in summer. The Promax aluminum linear pull brakes do a great job at stopping this nice bike even when it’s raining, so if you learn how to adjust them yourself, you won’t need to visit your LBS a lot. Riders as short as 4ft11in and as tall as 6ft claim that this bike fits them perfectly. So BUY IF you want to go around city or commute to work in a healthy way, the Schwinn Discover is the way to go! At first sight, a lot of people would not spot any differences between women and men bicycles. That’s because the differences are subtle. The main differences can be seen in stem length and top tube length, as well as in the saddle. On bikes designed to fit a woman’s body, the stem length and top tube length is shorter, to compensate for the fact that women usually have shorter arms than men. Women’s and men’s saddles usually differ in width and length. Women typically have a wider pelvis than men, so women’s saddles are short and wide, while men’s saddles are long and narrow. Other than that, the structure of the two frames can be different as well. Some ladies’ bikes have a top tube that is slanted down towards the pedals (Step-Thru Frames), but this does not affect the performance of a bike too much. This is a question that we get often, but it is a very difficult one to answer. The amount you should spend on a bicycle depends on the components you want to get and the reasons why you’re buying a bike in the first place. Generally, the more money you spend, the more reliability and quality you’ll get. Make sure that all of the important components are made either by SRAM or by Shimano. The best women’s cruiser bikes can be bought for around $350. There is no need to pay much more than that since these bikes are usually used for casual rides in the park and commutes. Sure, if you want to get better components, feel free to raise your limit to $500. When it comes to hybrid, mountain, and road bikes, the answer is a bit more complex. If you are a beginner or you want to buy a bicycle for occasional rides or casual weekend rides, you shouldn’t spend more than $500. Best beginner women’s bikes can be found for this price. If you’re planning to use your future bike to get fit or stay fit and frequently use it for training, aim to spend a minimum of $750. You’ll get decent components at that price, and everything above is a plus. 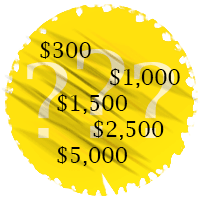 However, if you’re looking to train more seriously or even compete, the bare minimum you should spend is $2,000. Everything above that will give you much better components and reduce the weight of your bike. 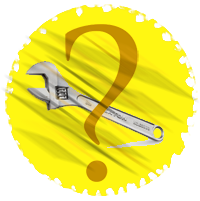 What Should I Know About Maintenance? Bike maintenance for women’s bikes does not differ much from that of men’s bikes. The most important thing is to make sure everything is lubricated and tight. Buy chain lube and apply it once a week, or every 40mi you ride. Before you apply a new coat of lube, wipe your chain with a clean cloth, with or without using a degreaser. Buy a chain measuring tool and put a new chain every 500 – 1,500mi, or when it gets too worn out. This will maintain good performance and prevent your cassette and crankset from wearing out prematurely, which is much more expensive to change. Keep your bike clean by washing it with water and non-abrasive soap, and make sure that your tires are pumped to proper air pressure. Have in mind that a more expensive bike is more expensive to maintain when you need to change some parts such as the chain, cassette, crankset, brake pads, and so on. How to Assemble My New Bike? When it comes to assembling, there are three main ways that you can go about this part. Learn How to Do It Yourself. 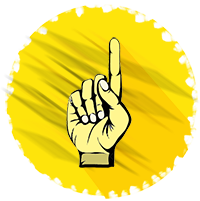 There are many tutorials available online, both written tutorials and videos on YouTube, where you can quickly learn how to do it yourself. All you need are a couple of tools that you can buy for cheap, and you’re ready. Take it to a Local Bike Shop. Your local bike shop can assemble your bike for cheap, so this is the easiest way to do it if you do not want to be bothered much. Order from Amazon. Most bikes that you order from Amazon will already be 85% assembled. All you need to do is tighten several screws, and you can start riding. Bike sizes may differ from one manufacturer to another because they might use different measuring standards. Therefore, it is a good idea to check the size charts on each manufacturer’s website. In most cases, your height, as well as your inseam length will be a good starting point against which you can start looking for the right size. Make sure to check this bike size guide to learn how to measure your bike size and get a good idea of how to choose the perfect one for you. A lot of manufacturers today have ladies’ bikes for sale, so it is not difficult at all to find them. However, some retailers have better offers, so you should choose wisely. These often have women’s bikes on sale, better customer service and bike service, and so on. Riding bicycles is amazing. If it is your first time buying one, we’re sure you’re quickly going to fall in love with it. How wouldn’t you, when it’s fun and cheap, and it can be very useful as well. Bikes are great for your physical appearance and physical health, as well as your mental health. You can do it to commute, to relax in the park, to explore the city or your area, to work out and get fit, or to compete – it’s up to you! We’ve presented you with 15 best women’s bikes from different categories, so this list has something for anyone! However, don’t worry too much about finding a women-specific bike, a unisex bike will be perfect for most ladies as well. If not, a couple of simple adjustments will make it work. If you have any questions or comments about any of the bikes, feel free to leave them below, and we’ll answer them as soon as possible. 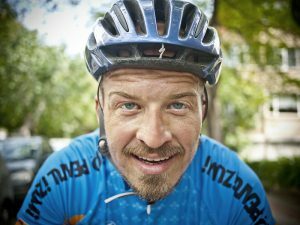 Great lessons here, for a person who has been off a bike for years! I’m 5ft7. Need a good bike in city. I am looking for a bike I will love as I have had many that I didn’t love. This guide was very helpful to me. I’m looking for a bike to attach baby seat on it. I will be using it around the city but would also like to use it on gravel trails.